If you want to become a local style legend you need to wear mens dress shirts that reflect style that is designed to get you noticed. Daniel Ellissa makes just the type of mens dress shirts for this task at hand. 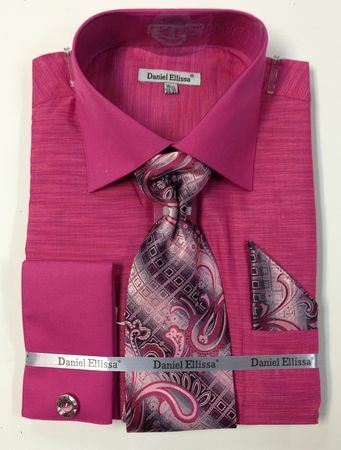 This fuchsia color french cuff dress shirt features a texture style fabric with solid color cuffs and collar. Tie set is included. Made of Cotton/Poly fabric.